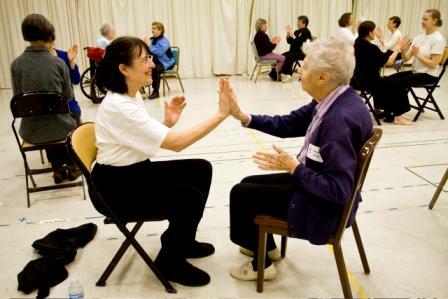 Michael Brookes, a member of the Brooklyn Parkinson Group who takes classes at the Mark Morris Dance Center, talks to WNYC’s Brian Lehrer about why participating in the Dance for PD class was a personal highlight of 2010. Patricia Needle, a member of PD Active who takes classes at Danspace in Oakland, CA speaks about her experience as part of KQED’s Perspectives program. Download the text of her program here. I want to thank you for teaching the class and sharing your expertise with those of us with PD. I just loved the class. I always wanted to be involved in dance and now I will be able to do this. I did not have to explain to anyone why I moved differently and that was such a freeing feeling. Thank you again for developing this program!! !